On our hot seat today is Big Brother Africa Season 9 'Hotshots' first runner up, singer, actor, TV host , Tayo Faniran. We have actually ve been trying to get this interview since 2014 but we finally got Tayo today. Tayo shared a lot in this interview with Laurasboxx. TAYO – I feel great, 30 is a great year, I’ve always looked forward to it and wondered how I’ll celebrate it and all the things I’d have achieved by the time in 30 and by the grace of God I’m celebrating today and I also have lots of testimony to share. Great things have happened to me. LBX – It’s almost two years since Big Brother Africa which brought you to the limelight. How’s life been and what’s been happening with you since you left the house? TAYO – Life has been good, career wise it’s been amazing. I’ve always been in the industry but now I’ve ventured into a lot like music, had endorsements, I’ve acted on tinsel and presented with star gist. I love the fact I’m versatile and can do different things. At the same time I’ve been pressured because I’ve been working on a platform that will sustain my relevance in the industry and that’s what I’m working on now. So now I’m not just a reality tv star, I’m also a brand. LBX – Weldone Tayo. So we’ve been looking forward to this in interview in the last couple of months. I wasn’t able to interview you after Big Brother Africa, so my next questions are Big Brother Africa related. READ: Kyle Duncan Kushaba: "My Big Brother Africa Journey Part 3"
First of all, What was your most memorable moment did you have in the whole of 91 days in the Big Brother Africa house? TAYO – My most memorable day has to be when I got the news about the birth of my son. I’ve been looking forward to that day and I was glad to know everything went well and God took care of it in my absence. LBX – Secondly, how did you handle the obvious dislike/ hatred from otherAfrican countries? Because it looked like the whole world was against you. TAYO – hahahahahahhahaha, Whilst in the house I was seeing it like you could hate me but I’m sure most people in your country loved me. And I came out and realized I was indeed hated by lots of housemates but outside the house Africa loved me. I’ve been to some African countries like Rwanda, Kenya, in Uganda they had my billboard on the road when I visited Kampala, the reception was lovely. Everywhere I went to I received love so the hatred wasn’t useful. LBX – Amongst all the housemates who didn’t like you , who do you keep in touch with now? They say time heals all wounds, have you severed ties with anyone? LBX – ... Cuts in... So all is well with you , Sheila, Nhlanla and Sammie? TAYO – between now and when I came out of the show I’ve grown, I’ve dealt with a lot of things, friendship, betrayal even those I’ve known for years have let me down so if someone i’ve known for years can let me down why can’t I make up with people I only met for three months. Moreover it was a competition so they probably had a reason to back theirs up. LBX – You’ve actually taken me to my next question. Recently a picture surfaced with you and Uti in a place together smiling. So is all well with Uti and Tayo? TAYO – Yes it’s like this. Uti is like a brother and we’ve had great times , good memories and I have things I can still look back and say thanks to Uti. We had a bit of issue at the wrong time, when I was going into the house and it got blown out of proportion. But on the 1st of January this year I felt i was getting into a new year and didn’t want to carry any grudges so I called him up, we apologized to each other and we are very good. LBX – Good to see you’re mending ways, but there’s a rumour out there that all isn’t well between you and Lekan. Are you aware? TAYO – I’m not having issues with anyone, I’m just focused on my family which is my girl and my son. I want my son growing up and getting close to his dad. So I have less time for friends and more for family. TAYO – hahahahah! I had lots of messages and posts I can’t possibly respond to everyone. When I woke up that morning I responded to the first few posts that were up. And come on, why do I have to prove someone is my friend when already I have introduced him as my friend. I can’t reach out to all my friends saying thank you personally and I sent a general thank you message. LBX – ok! Ok! Tayo, how’s Toye and any wedding bells ringing soon? TAYO – Toye is good, he’s a big boy now. I’m not pressured, I’ll do the wedding at the right time. But we live together and raising our son together but we’ve not made it official on paper. LBX – Are you back to South Africa finally? TAYO – No, there’s nothing like that. I’m still in Nigeria, still have a place in Nigeria. LBX – let’s get a bit lighter, what’s the fashion item you can’t do without? TAYO – Shoes, I love shoes. Most times when I go shopping I try to caution myself because I buy more shoes. By shoes, I mean sneakers. LBX – What’s was your biggest regret in the house? TAYO – hahahahah! I know, I heard. Well, I couldn’t help it, sometimes in life you can’t analyze what someone is going through. Most of the things that made me cry were personal and I’m an emotional person. LBX – So what should we expect from Tayo? TAYO – By the grace of God I’m launching a clothing line soon. I’ve been talking about it since I got out of the house but it got delayed because i had an endorsement with Payporte. LBX – Is the endorsement still on? TAYO – No it’s not on, it’s over… Like I was saying, Payporte is a fashion business so I had to hold on. But now that I’m not longer with them, I’ll be launching mine soon by the grace of God. LBX – We heard lots of proverbs from you and “shitTayosays, so give us one that fits the situation. TAYO – I’m from Oyo so my Yoruba speaking skills are highly concentrated, Heheheh! So I’ll say with all the questions asked and all that is going on in my life now ” Tí o bà ni ídí obinrin o kin je KUMOLU”. ( If there’s no reason a woman will not answer the name KUMOLU because it’s the name of a man). It means there’s a reason for everything I’m dealing with right now, no one is in my shoes and wouldn’t know what’s going on behind the camera. 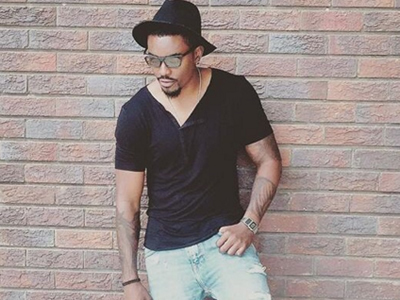 LBX – Who is Tayo Faniran? TAYO – I’m a man of my own world, sometimes I could be adamant and stubborn because I believe so much in my rules. I do things I feel like doing, I don’t follow people easily. LBX – Thank you so much Tayo, this interview has been interesting even though we have to edit some parts of it. I wish you well in your future endeavors our Ajani.